TH E M R EP O RT | 45 O R I G I NAT I O N S E R V I C I N G DATA G O V E R N M E N T S E C O N DA R Y M A R K E T ORIGINATION THE LATEST Homebuyers Attracted to Faster, Simpler Mortgage Processes Nearly 30 percent of recent buyers used online and in-person processes in tandem while purchasing their homes. 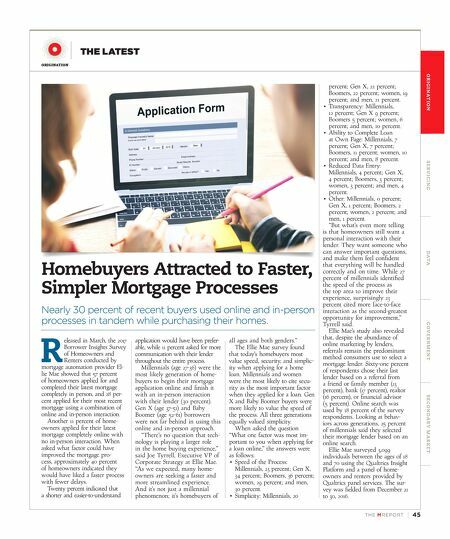 R eleased in March, the 2017 Borrower Insights Survey of Homeowners and Renters conducted by mortgage automation provider El- lie Mae showed that 57 percent of homeowners applied for and completed their latest mortgage completely in person, and 28 per - cent applied for their most recent mortgage using a combination of online and in-person interaction. Another 11 percent of home - owners applied for their latest mortgage completely online with no in-person interaction. When asked what factor could have improved the mortgage pro - cess, approximately 40 percent of homeowners indicated they would have liked a faster process with fewer delays. Twenty percent indicated that a shorter and easier-to-understand application would have been prefer - able, while 11 percent asked for more communication with their lender throughout the entire process. Millennials (age 27-36) were the most likely generation of home - buyers to begin their mortgage application online and finish it with an in-person interaction with their lender (30 percent). Gen X (age 37-51) and Baby Boomer (age 52-61) borrowers were not far behind in using this online and in-person approach. "There's no question that tech - nology is playing a larger role in the home buying experience," said Joe Tyrrell, Executive VP of Corporate Strategy at Ellie Mae. "As we expected, many home - owners are seeking a faster and more streamlined experience. And it's not just a millennial phenomenon; it's homebuyers of all ages and both genders." The Ellie Mae survey found that today's homebuyers most value speed, security, and simplic - ity when applying for a home loan. Millennials and women were the most likely to cite secu- rity as the most important factor when they applied for a loan. Gen X and Baby Boomer buyers were more likely to value the speed of the process. All three generations equally valued simplicity. When asked the question "What one factor was most im - portant to you when applying for a loan online," the answers were as follows: • Speed of the Process: Millennials, 23 percent; Gen X, 34 percent; Boomers, 36 percent; women, 29 percent; and men, 30 percent. • Simplicity: Millennials, 20 percent; Gen X, 22 percent; Boomers, 22 percent; women, 19 percent; and men, 21 percent. • Transparency: Millennials, 12 percent; Gen X 9 percent; Boomers 5 percent; women, 6 percent; and men, 10 percent. • Ability to Complete Loan at Own Page: Millennials, 7 percent; Gen X, 7 percent; Boomers, 11 percent; women, 10 percent; and men, 8 percent. • Reduced Data Entry: Millennials, 4 percent; Gen X, 4 percent; Boomers, 3 percent; women, 3 percent; and men, 4 percent. • Other: Millennials, 0 percent; Gen X, 1 percent; Boomers, 2 percent; women, 2 percent; and men, 1 percent. 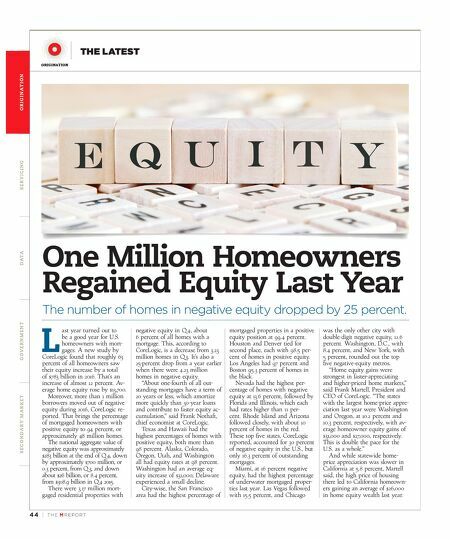 "But what's even more telling is that homeowners still want a personal interaction with their lender. They want someone who can answer important questions, and make them feel confident that everything will be handled correctly and on time. While 27 percent of millennials identified the speed of the process as the top area to improve their experience, surprisingly 23 percent cited more face-to-face interaction as the second-greatest opportunity for improvement," Tyrrell said. Ellie Mae's study also revealed that, despite the abundance of online marketing by lenders, referrals remain the predominant method consumers use to select a mortgage lender. Sixty-one percent of respondents chose their last lender based on a referral from a friend or family member (23 percent), bank (17 percent), realtor (16 percent), or financial advisor (5 percent). Online search was used by 18 percent of the survey respondents. Looking at behav - iors across generations, 25 percent of millennials said they selected their mortgage lender based on an online search. Ellie Mae surveyed 3,099 individuals between the ages of 18 and 70 using the Qualtrics Insight Platform and a panel of home - owners and renters provided by Qualtrics panel services. The sur- vey was fielded from December 21 to 30, 2016.